You could compare LED light therapy for the skin with how light of the sun influences your skin and plants. May be you have read about the photo-synthesized process on plants. Well, that's roughly the same way the LED light therapy for skin works. Plants use a certain pigment substance to convert sunlight into cellular building blocks, which is similar to light therapy that stimulates your skin cells to create new proteins. A skincare LED light therapy device also uses deep thermal heat for optimal performance. LED light therapy is also called Photo rejuvenation or photo facial therapy. These light therapy devices are also available as light therapy face masks. For treatment of skin anti-aging, red and infra-red LED light will be applied. These red LED lights for skin care which are set at certain wavelengths improve skin texture, color, and tone. As a result of its working on and in the skin, the appearance of fine lines and wrinkles diminishes. The infrared wavelength enter the deep vascular inner layer of the skin and because of that the blood flow will be stimulated and also making the skin muscles more relaxed. The red light wavelength supports skin cells which develop connective tissue in the inner layer of the skin. This process stimulates the production of collagen* and elastin**. As a result your skin becomes firmer and the wrinkles and facial lines decreases. Another advantage of this red LED light working is that it reduces inflammation, so the redness of inflammatory facial spots. * Collagen is a protein responsible for the shape and strength of the skin and is situated in the Dermis which is the deep vascular inner layer of the skin. ** Elastin takes care of the elasticity of the skin. The skin rejuvenation and intradermal collagen increase effect was also confirmed in a 2014 study about the efficacy of red and near-infrared light treatment in patient satisfaction, reduction of fine lines, wrinkles, skin roughness, and intradermal collagen density increase. And also in earlier years evaluations indicated improvements in softness, smoothness, and firmness of the skin when applying Infrared (830nm wavelength) and Red (633 nm wavelength) LED lights. Here's more on How Red LED light therapy can help your skin. Just recently. in another reseach was confirmed that red light therapy indeed reduces wrinkles / lines around the mouth. Besides red LED light devices, there are also multi-color LED light devices that can emit red light, see these multi-color light therapy devices. Red Light for Dry Eye Disease. Research and extensive patients tests have shown that red light can help you when having dry eyes. But it still me take a while before you can buy a red light therapy device for at home use that can be applied for Dry Eye Disease, DED. The red light works between 600 en 650 nanometer wavelength and exposed just a very short period of time to closed eyes, on a daily or weekly basis. Read more about this red light therapy researched by the Toyos Clinic. Acne usually is a combination of factors such as hormones, improper function of certain skin glands, dehydration, excessive oiliness, inflammation, swelling and bacteria. Such a condition may also lead to clogged or blocked pores - whiteheads, blackheads..
Blue LED light of a certain wavelength makes that acne bacteria are killed when they are hit with certain wavelength light. The light energy also stimulates tighten pores and reduces oiliness of the skin which process leads to a less 'oily' substance. Altogether it has a rejuvenation effect on the skin. In combination with red light wavelength, the light energy also decreases redness and reduces inflammation. When you carefully follow the directions for applying the blue LED light, the light energy also treats marks and may keep outbreaks away. When using topical medication, you can combine that with the blue light therapy. Blue LED light treatment results in a reduction of inflammation and the number of acne lesions. It appears to be a safe and effective additional therapy for mild to moderate acne and for improveing skin condition. If you want you can read about a blue light study here. You can also check another study at the U.S. National Library of Medicine National Institute of Health. 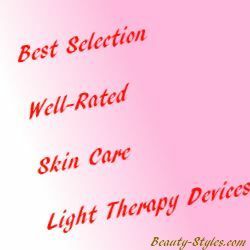 Blue LED Light devices for skin treatments. By dermatologists recommended routine to treat acne. - Red and blue light as handheld, table model or mask. Sun damage and blue light. Treating sun spots with blue light may help preventing a form of skin cancer. These treatments are covered by health insurance if your doctor indicates that you should get such light therapy. Read and see more about this at WBALTV: Blue light therapy helps reduce the risk of skin cancer. Another use: Read what certain blue light has to do with vitamin D.
A good alternative to lightening creams is using green LED light therapy for age spots / dark spots, hyperpigmentation, freckles, discolorations and sun damage. The light energy lightens and fades overpigmentation, protects it from future discolorations and improves the skin tone. The green light influences the melanin producing cells in the skin. This process lead to limiting overproduction of melanin and also prevents it from going to the surface of the skin. The process takes care of melanin clusters leading to less discoloration. Applying the green LED light therapy in line with its directions, gives the feel and appearance of a softer and more luminous clarity, and radiant tone. A recent study in China confirmed again that treatment of acne with a newly developed LED light device equipped with green (543-548nm) lights and red (630nm) lights was effective for moderate to severe acne. 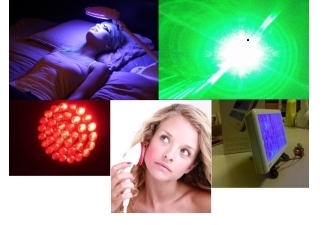 Green LED light may also have a positive effect on melasma, inflammation and pain. Talking about pain relief, a recent study at the University of Arizona revealed positive effect of green LED light treatments of pain. The research was done with rats suffering from neuropathic pain. To find out if green LED light has same positive effects on people with certain pains, a clinical trial involving people suffering from fibromyalgia is underway. Here's to read more about this UA study. This light therapy passed a lot of scientific tests, experiments, evaluations. The technique originates from NASA, starting first with tests of growing plants in space. Then the many users experiencing significant improvement in their skin condition after treatments with a light therapy device. Many articles are written on the subject and positive effects of the therapy continue to appear in publications. Well, you can use the light therapy device on any part of your skin. Most people use it to improve the appearance of the face, neck and chest. Cheeks, around the mouth, under the eyes, around the eyes (crowsfeet), forehead, neck. Mind that you close your eyes when treating around the eyes. When will you notice effects from LED light therapy? First of all, you know no one is the same. People have different skin condition, age, physical condition, diet, and different habits. Applying this LED light therapy it is known that generallly, you may notice results in two to three weeks. But on an individual basis that can be earlier or later. It is also assumed that when following the guidelines in the manual of the LED light therapy device for a certain period, say eight weeks, you may see significant improvement in the appearance of wrinkles and lines. Skin appearance should also be radiant, healthy and even-toned. 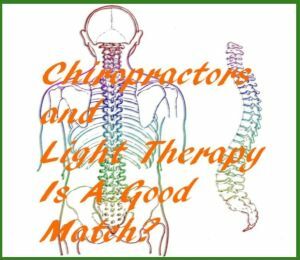 Not only is light therapy helpful in fighting certain skin conditions, but now, chiropractors who treat spine and vertebrae te relieve certain pains such as back pain, have also discovered the healing possibilities of blue, red and infrared led light therapy. I believe this light therapy is especially useful in stimulating the working of body cells in order to reduce pain. More Vitamin D with BLUE Light? Besides positive effects on your skin with blue light treatments - wavelengths, say 410 to 425 nm - there may be another positive effect using blue light with a certain wavelength. 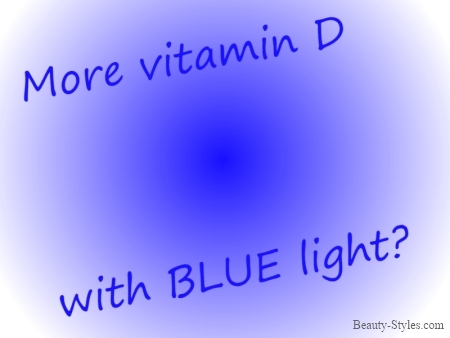 You may generate vitamin D when using a blue light with a wavelength of about 480nm. So, a device emitting blue light of about 480 nm (nanometer) would be a better choice. For now such devices are not yet available but a light device that comes close is the Philips GoLITE BLU Energy Light. A recent study indicates that certain blue light may have a positive influence on improvement of vitamin D levels by boosting infection fighting T-cells in the inner layer of the skin. Here's more on the study by researchers from Georgetown University Medical Center. Vitamin D is important for bone growth, protection against osteoporosis and more. Here's to read more about vitamin D.